Grey surface mountable gravity vent with a 310mm diameter hole. Flaps have an aerofoil section with the weight concentrated at the pivot point. This feature ensures easy opening and minimal pressure drop. Nylon spindles give silent and maintenance-free operation. This is a 125mm vent, it is a grey colour and has been treated to be safely placed outside. 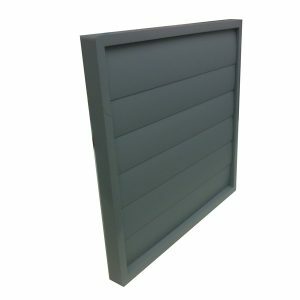 This is a 100mm vent, it is a grey colour and has been treated to be safely placed outside.